In October of last year, New York City joined a number of US jurisdictions (full list below) in passing a law that bans hiring employers from asking candidates for their salary history. Since most hiring companies determined a candidates salary base some percentage increase over their last salary, the pay gap would follow women throughout their careers. Women, who started out making less than men, perpetuated the gap, as they moved from job to job. The pay gap also widened with age, and because women were not encouraged to ask for more, the gender gap became even more difficult to close over time. According to Equal Pay Negotiations, these figures could add up to almost $2 million in lost revenue over a lifetime. When interviewing, I myself have always dreaded the salary question. Even if you tried to take a strong stance and firmly set your expectations, you would pretty much lose all negotiating leverage, once the hiring employer found out your previous salary; your salary would become the benchmark for your new wage. Paying too high of a percentage increase would be frowned upon, so most companies would low-ball the candidate, rather than pay what the job is worth. Your options to regain leverage were somewhat limited. And if you think that lying is a good strategy, think again - lying could disqualify you for the position and if you were caught after you’ve been hired, it could be grounds for dismissal. But new legislation in NY now prohibits employers from asking candidates what they made in their last jobs. To ensure compliance, stiff fines of up to $250K per candidate could apply. And while many believe this new law is an important step towards narrowing gender pay, it could actually have the opposite effect and widen the pay gap. Studies have shown that men are much more aggressive than women when it comes to negotiating and asking for what they want. A recent survey published by Glassdoor states that women negotiated less than their male counterparts with 68% percent of women accepting the salary they were offered. This is a 16-percentage point difference compared to men (52%). Studies confirm that when it comes to salaries, women are simply more willing to settle than men. Most women also do not realize that many companies set aside money with the expectation that employees will ask for better compensation packages. Yet only 30% of women bother to negotiate at all, while 48% of men negotiate. So why aren’t more women negotiating? Studies also suggest that women are simply afraid to ask. Women lack the confidence needed and have a lower perception of their value than men. Women feel that there is still a stigma associated with asking for money and they believe there will be negative consequences for asking. While all this may be true, we need to change our mindsets because negotiating is a key factor that can help us close the gender pay gap in the workplace. With the change in law, we finally have the opportunity to narrow the gap, but we also have to do our part. Now more than ever, it is critical for women to step up their game and brush up on their negotiating skills. So how good of a negotiator are you? 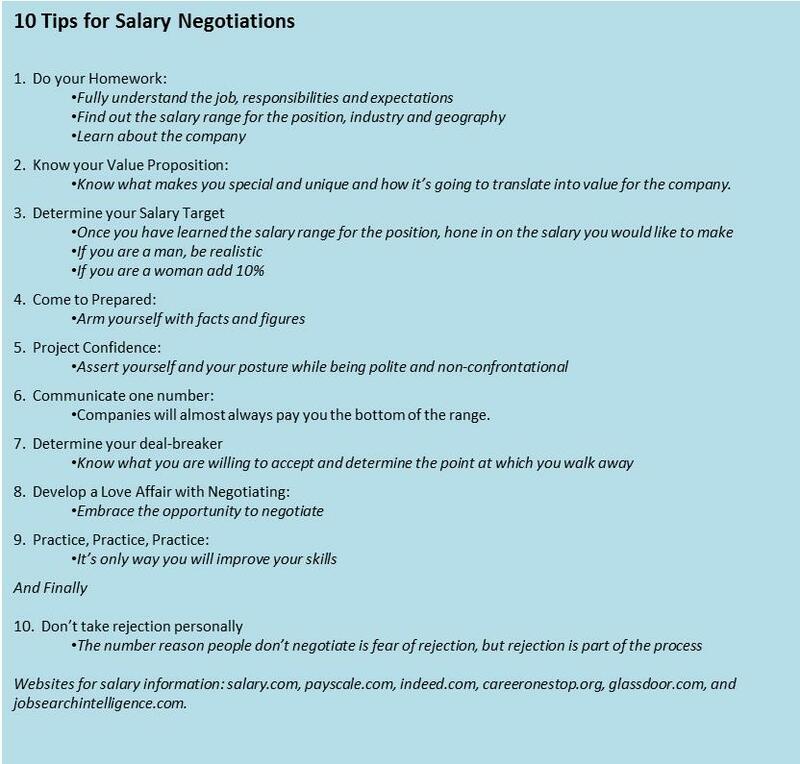 Below are some tips to help you up your negotiating game. California—The Golden State’s law is more comprehensive than those in other jurisdictions, banning employers or their agents (such as temp agencies and outside recruiters) from seeking salary and benefits information. An exception is made for salaries that are disclosable to the public under state and federal freedom of information laws. Effective Jan. 1, 2018. Delaware—Companies cannot ask applicants or their former employers for salary histories and cannot conduct salary-based screening of job applicants to make sure previous compensation meets minimum or maximum amounts. Effective Dec. 14, 2017. Massachusetts—As part of a broader new law aimed at equal pay for equal and comparable work, the Bay State bans organizations from seeking information about an applicant’s past pay. However, employers may confirm salary information if offered voluntarily by the applicant, and after an offer of employment with compensation has been made. Effective July 1, 2018. Oregon—Employers are barred from taking a person’s current or previous salary into account when screening applicants or determining their salaries. Companies may ask about a person’s salary history after making a job offer, including a specific level of pay. Most of the law’s provisions become effective on Jan. 1, 2019. Puerto Rico—Employers may not ask about salary history unless an offer has been extended. Effective March 8, 2017. New York City—Companies cannot ask about past salary, nor base wages on pay history at any phase of the employment process, unless the applicant reveals the information willingly. The statute applies to all employers, even those with just one employee. While the law does not cover public jobs subject to collective bargaining agreements, a separate mayoral directive bars city government agencies from inquiring about a candidate’s salary history. Effective Oct. 1, 2017. San Francisco—Employers cannot ask about past salaries or release pay information to another San Francisco employer without the worker’s written permission. Effective July 1, 2018. In January, a number of jurisdictions banned the question for public-sector applicants only: In Pittsburgh, the law applies to city employees; in New Orleans, it covers city workers and contractors; and in New York state, it encompasses state job applicants.